Lifesystems' Chlorine Dioxide Tablets are a safe and effective method of disinfecting your drinking water while you are travelling to regions where the safety of your water supply is questionable. They kill bacteria, viruses and cysts, including Giardia and Cryptosporidium. Each tablet treats up to one litre of water and has very little after taste. Once your water has been purified it can be kept in a sealed container for up to three days. British brand, Lifesystems, has protected adventurers and explorers for over 25 years against whatever the elements and fate have thrown at them. Today they work with leading expedition and emergency medical experts travelling in the world’s harshest regions. 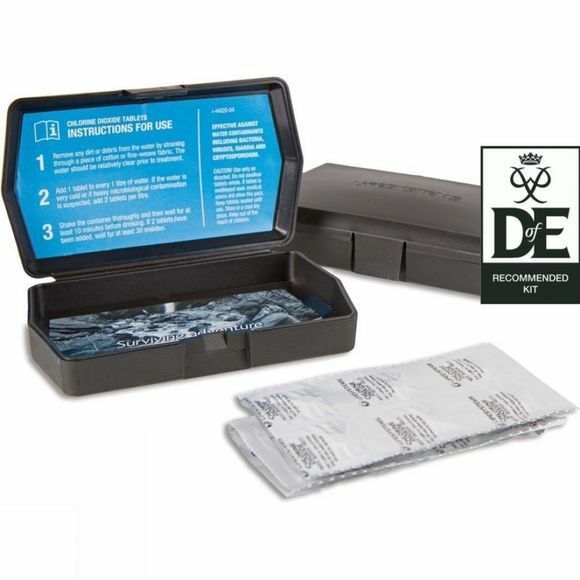 This expertise is used to create a collection of outdoor medical and survival products to withstand the most extreme conditions and environments. Through constant research and scientific innovation, Lifesystems can help you survive your toughest adventures.